Elevate your photography skills and vision in the John Muir Wilderness! Update 4/19/18 - Please Note: This year’s workshop is sold out, but we will be doing it again in 2019. Subscribe to our mailing list or join our Facebook group to be notified as soon as it is announced! Get ready for 5 days of intensive photography education, inspiration and practice in the heart of the spectacular Sierra Nevada! This is your opportunity to create your own masterpieces in the same magnificent mountains that inspired Ansel Adams, Galen Rowell and countless others. 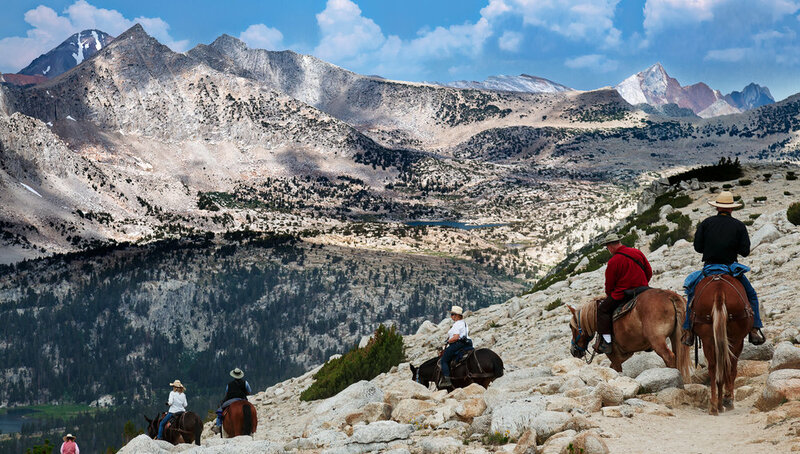 Our destination is Pioneer Basin, deep in the John Muir Wilderness. Truly a photographer’s paradise, this remote location is not easy to access. Fortunately, our equine companions will help us with the heavy lifting as we ride into this stunning alpine environment. Alpenglow, Golden Hour, Blue Hour…these are the conditions that produce portfolio images. Therefore, our days will start early and end late but there will be plenty of time in between to explore or just soak in your surroundings and appreciate the unspoiled beauty of true wilderness. Your level of photography experience is not as important as your desire to grow your image making abilities. Ken will serve as your group leader & photography instructor for this unique adventure offered by Rock Creek Pack Station. RCPS’ expert guides are equipped with detailed knowledge of the natural history of the Sierra as well the ability to wrangle up some amazing mountain meals. No prior riding experience is required but this trip requires a basic level of fitness including the ability to walk at high altitudes for several hours at a stretch. If you have any questions about your fitness to tackle this adventure, please contact RCPS. A 20% ($310) deposit is required to secure your reservation. 8% regulatory reservation fee, 2% USFS fee and $15 Wilderness Permit apply (in addition to Trip fee). Full payment due thirty days prior to starting date. Trip reservation deposits are NON-REFUNDABLE. If you need to cancel your reservation, your deposit may be applied to another RCPS trip in the same calendar year. Final payments within 30 days of starting date are NON-REFUNDABLE. Payments (less deposit) will only be returned only if you fill your spot on trip. No transfer of deposit or trip fees to following year for cancellations. RCPS advises guests to purchase trip travel insurance if you don't want to assume risk of losing payment due to illness or family emergency. What's Included: All meals, tent lodging, pack & riding stock, guides/wranglers/cooks, photography instruction. What's Not Included: Photography equipment, sleeping bag and pad, personal items, gratuities, alcohol.